The ability to mould a group of talented individual athletes into an effective team takes effort and skill. Team Building in Sportexamines the crucial factors in the development of an effective team, introducing important psychological and organisational concepts and offering evidence-based interventions for enhancing the performance of any sports team. The book neatly bridges the gap between theory and practice, with real sporting case studies, examples and practical tools included in each chapter . It covers the full range of issues in team sport, including: Planning Communication Cohesion Motivation Emotions Momentum Leadership Recovery No other book offers such an up-to-date, relevant and applied guide to working with sports teams. 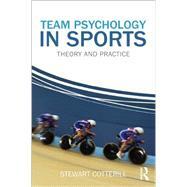 It is essential reading for all students and practitioners working in sport psychology or sports coaching.